sending you information about Milly Days and Milly Giveaway, our supporters and beneficiaries for marketing purposes. We will not contact you for marketing purposes unless you have given your express consent. If you have consented to receive marketing, you may opt out at any time. Please see the ‘Unsubscribe’ section below for more information. When you visit our site, we sometimes collect information that enables us to identify you and provide you with a more personalised service. We also aggregate statistics about our supporters to enable us to operate more effectively, but these statistics do not include information which can identify individuals. We will keep your personal information confidential, and will not supply it to any third party without your consent, unless we are obliged or permitted by law to do so. Where we work with partner organisations, we may need to refer your questions to them in order to respond fully. We sometimes use third parties to process your information on our behalf (for example, to process donations, send out mailings, or analyse data). However, we require them to keep your information secure and not to use it for their own business purposes. Some of our service providers may be located outside Europe, such as the U.S. or Canada, and by providing personal information to us, you consent to your information being processed on our behalf in these countries. By providing personal information to us, you consent that we may transfer your information within Milly Days and Milly Giveaway. Cookies are small pieces of information (in the form of text files) which are sent from our website to your computer or mobile phone and which are stored on your device's hard drive. They help you use our site more effectively, and help us assess how our site is used. Please note that if you remove some of our cookies, you may not be able to use our site as effectively. During your visits to our site you may notice some cookies that are not related to Milly Days and Milly Giveaway. You should check the third party websites for more information about these. If you are under 16, please make sure you have your parent or guardian's permission before you provide us with any personal information. Children under 16 must not provide us with personal information without this permission. This site is owned and operated by Milly Days and Milly Giveaway whose place of business is 35 Gloucester Place, London W1U 8HZ, UK. 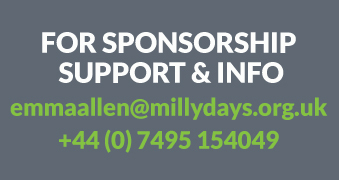 Milly Days and Milly Giveaway are operating names of Charity Projects, a charity registered in England & Wales with number 1162422, and a company limited by guarantee registered in England with number 9526703. Our registered offices are 35 Gloucester Place, London W1U 8HZ, UK.